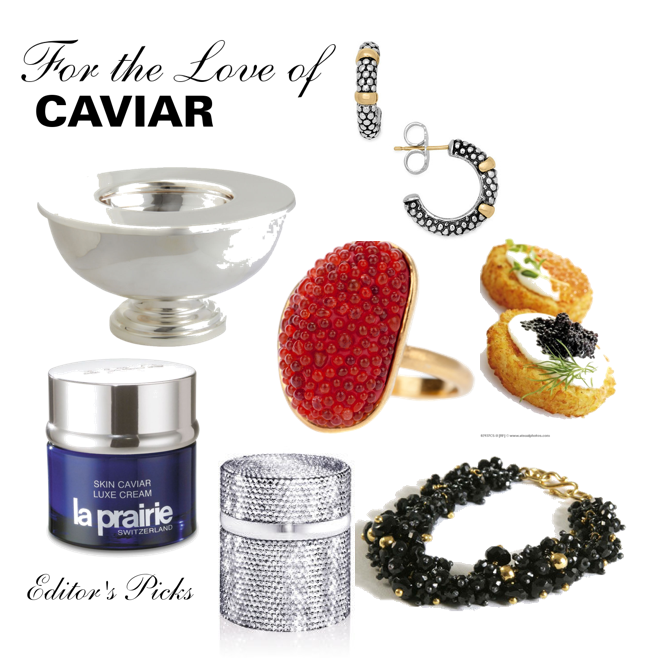 Our Editor in Chief loves caviar and while the editorial department peruses and researches for an upcoming articles on caviar, she selected these beautiful pieces on which to use, dine and to wear. Left to Right: Barney’s New York Caviar Server, La Prairie Caviar Luxe Cream (in traditional blue and Swarovski edition), Glint caviar bracelet, black Spinel agate, Caviar appetizer (perfect with Champagne! ), Jaqueline Clark ‘Caviar’ ring, Lagos hoop earrings.